Description: The Ultimate Fighting Championship® travels to Tampa for the first time for UFC® Fight Night™ at the Sun Dome on February 7th. In the main event, rising lightweight star Joe “J-Lau” Lauzon will look to propel himself into title contention when he squares off against Jeremy Stephens coming off a stellar knockout win. 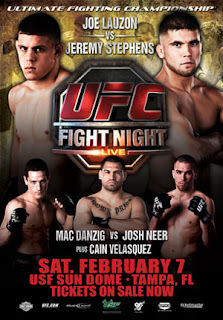 Plus, The Ultimate Fighter series is well represented when season six winner Mac Danzig faces Josh “The Dentist” Neer, and Derek Downey takes on unbeaten Nick Catone. I didn't outright say it, but I thought GSP would win, but I did say that I was rooting for Penn to win. If you care about America and our freedom, you will be very concerned. P.S. And if you find that you agree with the concerns I expressed in my blog post, please blog this yourself, and let's spread the word! No disrespect intended: I cut and pasted your comment from the original post to this one, as it was unrelated to the original post's content about the passing of my grandmother. Actually, I should move your GSP-Penn comments to my UFC 94 post LOL. I thank you in advance for your understanding. My sincerest apologies if that seemed heartless. :-( I admit I had not read that post and I apologize sir. I heartily thank you for reposting the information though!